Really, once you start fostering, you get over the "want to keep them all" syndrome really quick! Some dogs fit in with your family, and some don't and can't get adopted & gone soon enough! And keep in mind, some of us have been doing this for a long time! Yes, I've adopted 4 dogs, but I've been doing this for nine years, and have fostered over 100 dogs. And believe me, I did NOT want to keep them all! Well, and then there are those dogs who are just too special to let go, so you HAVE to adopt them! Hey, I resisted for over a year! I really thought he would be happier with a real job. Apparently not. 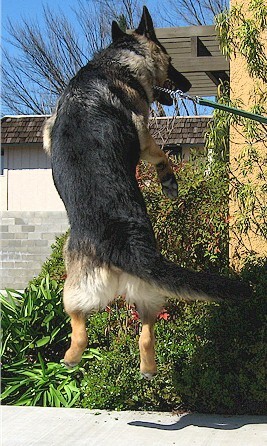 The last thing I needed was ANOTHER confident male GSD to go along with the other 3 that I already have! And compared to my other 3 "monsters" (as Lisa calls them), Riker is quite petite. 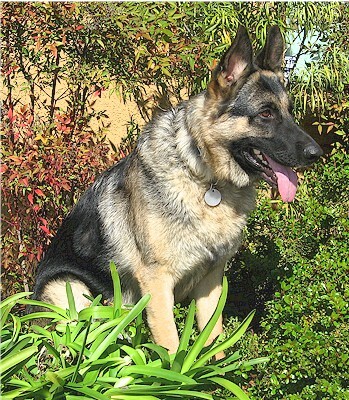 He's small even compared to most male GSDs, in everything but attitude -- he lacks nothing in that department! And of course, "twit" has everything to do with his neener-neener- can't-catch- me, never-take-a- correction- seriously, in-your-face attitude. Usually preceded by "adorable," "charming," and "cute." Thanks for the congrats! Life is not dull with my foursome around. And congrats to Kim & John for giving sweet little Ebony a great home, to Ellen for keeping Zack, and to Laurie for taking in Kelly! This was the weekend for foster failures all around. Foster failure #4 for me. I understand there was a wager among several of the Modesto folks way back in August when Riker came back after being in an FTA home for 3 months. The way I heard it, Gary needs to pay up to Mike & Lisa! Riker is a fiesty young male, around 3 years old, affectionate, very alert, and cute as a bug's ear. 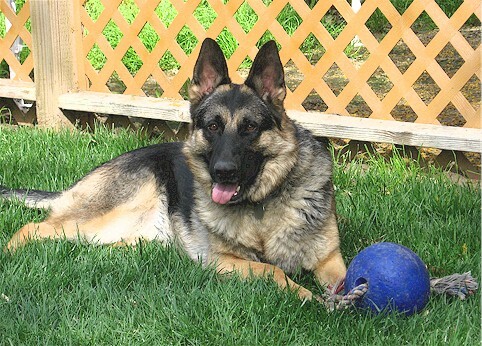 He's on the smaller size for a male at 65 pounds, very handsome in a classic black & tan coat. He's a very active boy with a lot of energy and an in-your-face attitude. Riker is completely housebroken, and very well-mannered in the house. He settles down very nicely as long as he's had enough exercise, and wants to be in the same room with his person, happiest when laying on his dogbed and gnawing on a dog bone. He's very affectionate without being clingy or needy. He tends to vocalize and circle when he gets excited, and once in a while his excitement will lift his feet straight off the ground. He has considerable working drive, he wants to pull at clothing to hurry things along, so he can inadvertently pinch skin at times. He never takes a correction seriously, and always has to get the last word in. He'd be way too much for a home with small children, he really needs a working home. He knows Sit, and has learned to Wait, Move out of the way, Get Out of the Kitchen, and Go Lay Down. He still needs some work on his leash manners. He loves going for rides and behaves well in a vehicle. He loves chewing on filled dog bones and his favorite toy is a jolly ball on a rope. He loves to play ball, and would probably LOVE a tug toy if given the chance. He gets along with other respectful dogs but won't tolerate any nonsense and doesn't want to play rough. He's a confident male, he gets along well in a balanced pack, and loves to play with a playful female dog, not so much with male dogs. He has serious prey drive and is a serious fence-fighter, so he'll need someone who understands how to prevent that from escalating. Riker is looking for a home with a very experienced owner who can stay one step ahead of this smart little cookie, and will give him plenty of exercise and obedience. He'll be dynamite companion with the right training, and an utterly charming off-duty pal. NO CATS, SMALL DOGS OR OTHER LITTLE FURRY CRITTERS. NO SMALL CHILDREN. 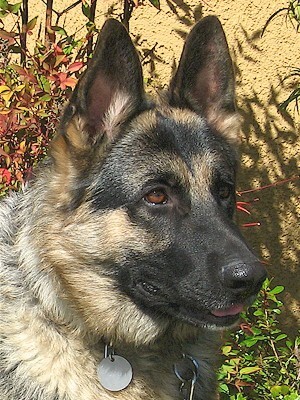 Riker is a fiesty young man, around 2 years old, affectionate, alert, and cute as a bug's ear. 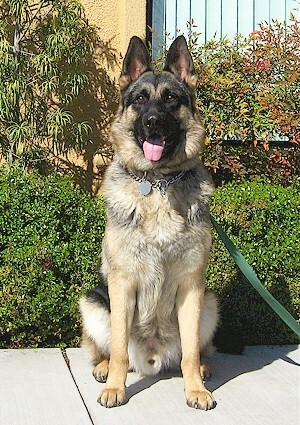 He's on the smaller size for a male, around 60 pounds when filled out, in a classic black & tan coat. He has the long, lean, American-bred conformation and is quite handsome. He's an active boy with a lot of energy and an in-your-face attitude. Even while emaciated, he never slowed down or lacked enthusiasm. This literally starving boy has been diagnosed with SIBO - Small Intestine Bacterial Overgrowth. He was unable to absorb food and had life-threatening diarrhea. He has been on the proper antibiotics now for a month and is doing very well. He's gaining much-needed weight from a skeletal low of 47 pounds up to 53 pounds, and his stools have finally cleared up. He'll need to continue on his antibiotics for at least another month, but all indications are that he's well on the way to good health. Now that he isn't literally starving, he no longer gets into the garbage or chews on things he shouldn't. Riker is completely housebroken, and has never made a mistake in the house as long as he has access outside. He settles down in the house very nicely as long as he's had enough exercise, and wants to be in the same room with his person, happiest when laying on his dogbed and gnawing on a dog bone. He's very affectionate without being clingy or needy. He's learning that jumping up on people isn't appreciated and he doesn't need to get nippy when he gets excited. He'll still jump up to see if someone is carrying food in their hands, but he no longer mouths first and smells later. He'd be too much for a home with small children. He knows Sit, and has learned to Wait for his dinner (very difficult for a starving dog! ), Move out of the way, Get Out of the Kitchen, and Go Lay Down. He still needs some work on his leash manners. He loves going for rides and behaves well in a vehicle. He loves chewing on filled dog bones and his favorite toy is a jolly ball on a rope. He loves to play ball, but not enough for a working home. He gets along with other respectful dogs but won't tolerate any nonsense and doesn't want to play rough. He's a confident male, he gets along well in a balanced pack, and will play with a playful female dog, not so much with male dogs. He's a serious fence-fighter, so he'll need someone who understands how to prevent that from escalating. Riker is looking for a home with an experienced owner who can stay one step ahead of this smart little cookie, and will give him plenty of exercise and obedience. He'll be dynamite companion with the right training, and an utterly charming off-duty pal. NO CATS, SMALL DOGS OR OTHER LITTLE FURRY CRITTERS. 10/27/08 Got the results back on Riker! Good news/bad news. Good news is he does NOT have Exocrine Pancreatic Insufficiency. Bad news is he has SIBO - Small Intestinal Bacteria Overgrowth and he's not absorbing any vitamin B12 in his system. So we've switched him to Tylan (antibiotic & anti-inflammatory) and will be giving him B12 shots, although where they'll find enough muscle on his skinny little self to inject anything is questionable. The SIBO will take a good month or two to clear up, so he's got a ways to go yet. Poor guy is down to weighing practically nothing, the diarrhea got much worse over the last week. So here's hoping the Tylan starts working fast! Riker has had some digestive issues that need solving before he'll be available for adoption. Riker is a fiesty young man, around 2 years old, affectionate, bratty, and cute as a bug's ear. 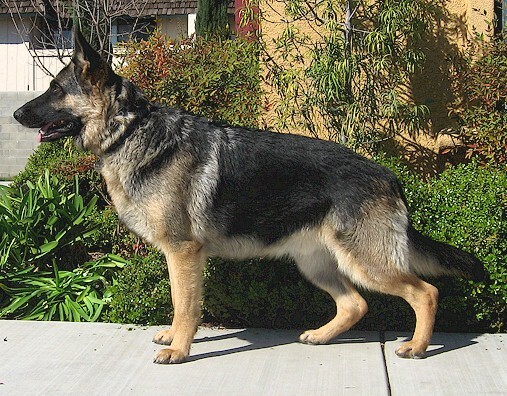 He's on the smaller size for a male, only around 60 pounds in a classic black & tan coat with the long, lean, American-bred conformation. He's a cocky boy with a lot of energy and an in-your-face attitude. This charming rascal is a busy fellow, into everything. He knows how to open flip lids on garbage cans for leftovers, he loves to steal tissues out of the trash, and takes particular delight in shredding rolls of toilet paper. If no paper products are available, he loves chewing on filled dog bones and his favorite toy is a jolly ball on a rope. He's completely housebroken, and has never made a mistake in the house as long as he has access outside, even with his unpredictable bowels. He settles down in the house very nicely as long as he's had enough exercise, and wants to be in the same room with his human, happiest when laying on his dogbed and gnawing on something. He's very affectionate without being clingy or needy. He's learning that jumping up on people isn't appreciated and he doesn't need to get nippy when he gets excited. He'd be too much for a home with small children. He knows Sit, and is trying hard to learn Wait. He gets along with other respectful dogs but won't tolerate any nonsense and doesn't want to play rough. He's definitely a dominant male, so he'd probably do better in a home with an easy-going female dog than with other males. He's a serious fence-fighter, so he'll need someone who understands how to prevent that from escalating. Riker is looking for a home with an experienced owner who can stay one step ahead of this smart little cookie, and will give him plenty of exercise and obedience. NO CATS, SMALL DOGS OR OTHER FURRY LITTLE CRITTERS. 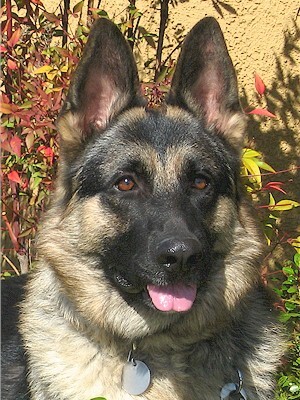 Riker is located in the Modesto area. Riker came into our program in September 2008 as an owner turn in to Sacramento County from someone who had too many dogs. Riker was a thin, appx 18 month old boy, on the small side for a male, seemed to be moderate energy, cute as a bug's ear and seemed to be very sweet. He had loose stools, not uncommon for a dog out of the shelter. He went to a foster-to-adopt home and turned out to have way too much drive, energy and nippiness for a home with a small child, along with worsening diarrhea. Over the next few months, his diarrhea became life-threatening and he was rapidly dropping weight while we tried to figure out what was going on with him. He was down to a terrifying low of 47 pounds (on a 67 pound frame), nothing but a walking skeleton covered by hair. 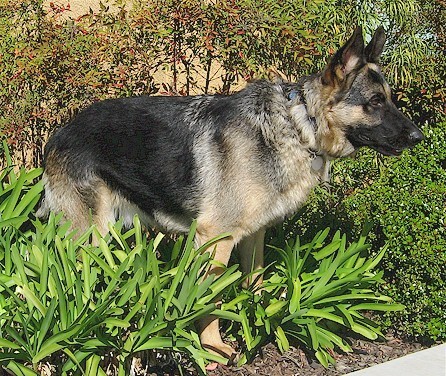 After testing him for everything our vet could think of, he was finally diagnosed with small-intestinal bacterial overgrowth (SIBO) later complicated with Coronavirus. Once he was put on the proper medication, he gradually turned the corner and started to gain some weight back. By December 2008, he was doing well, he was up to 58 pounds on a full tummy, 57 pounds on an empty one for his fasting blood test. From his low of 47 lbs, he was looking MUCH better. Still a little thin, but definitely improved. His stools were mostly better, sometimes still runny, but on the whole, very good.